Home » Stories and Recipes » Butter » I ❤ Jason. That morning my first soufflé was flavored with Manchego cheese and jamón Serrano, both Spanish, that we had in the cheese drawer. Here is the recipe below, adapted from Julia Child. Forget all of your fears, soufflés are really quite simple. I have never had one fall in the oven, and entertain of brings lots of big boys stomping around our kitchen. By your second soufflé you’ll have it in the oven within 25 minutes and served, with a vinaigrette-dressed salad, within an hour. Make the béchamel sauce: Melt butter in a small saucepan over medium-low heat. Add flour and stir 2-3 minutes being careful not to brown the roux. You are cooking the raw flavor out of the flour. When ready, it will smell pleasantly sharp. Bake for 25 minutes. Do not open the oven for the first 20 or so. 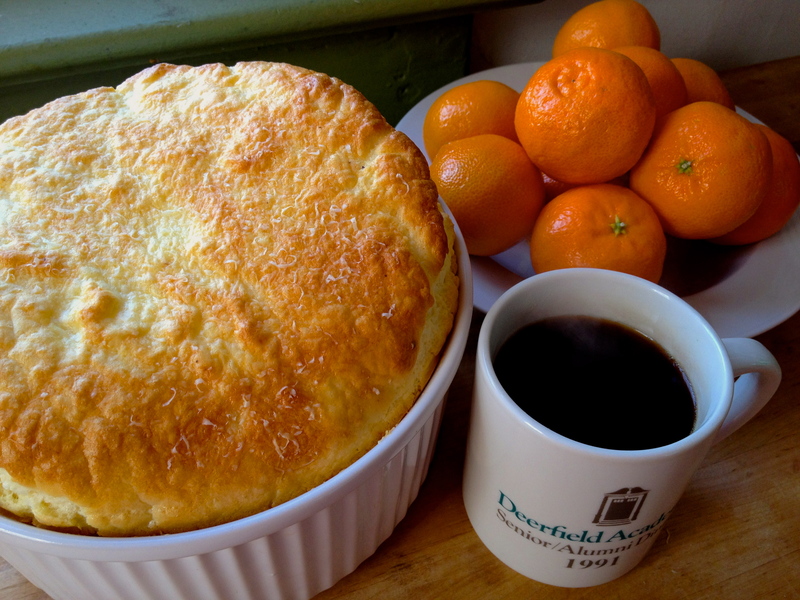 The soufflé is done when the top is golden brown and moves slightly in the middle when shaken. I prefer mine still wet in the center. Serve immediately. Warn your guests ahead of time so they are seated at the table and can witness your soufflé in all of its glory! And Ann, what is your connection to DA? You two are ridiculously sweet! Hubs and I exchanged Valentine’s Day cards this morning and laughed when we realized that we got each other the same card – again. It’s awesome to be so in sync with your partner! Oodles of love to you both. Thanks Tammie! I love that you have gotten each other the same card more than once!